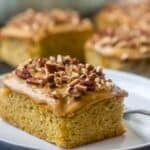 Pumpkin spice cake recipe – Deliciously moist gluten/grain free spice infused cake topped with a cinnamon dairy free cream cheese frosting. One of the many perks of the fall and/or winter time has to be the comfort food which goes hand in hand with the season. Although I do loathe cold weather I do enjoy cosying up by the fire place to some vegan orange hot chocolate and a good book or having some African inspired almond soup . 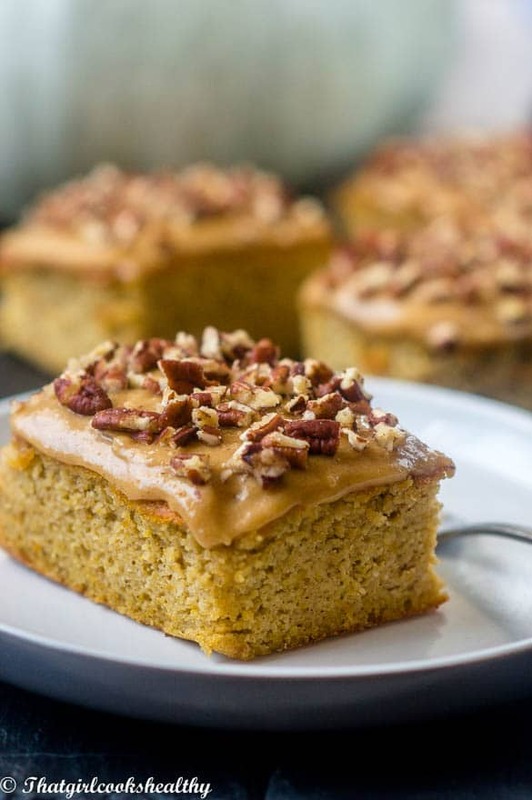 This pumpkin spice cake recipe will hopefully be on your hit list – a moist, sweet and equally delicious treat. While there seems to be more emphasis on soup and hot drink, we fail to acknowledge comforting sweet treats and desserts. Well I certainly haven’t but then again I am known to be greedy so maybe that’s why. You know it’s winter when the pumpkin and butternut squash are abundant in the supermarket. I’ve been dying to share this pumpkin spice cake recipe because it is the culinary epitome of the fall. The good news is that my pumpkin spice cake recipe is suitable for people who are leading a low carbohydrate lifestyle and/or gluten free. There is no flour blend where multiple grain free flours are mixed together to form a cake mix. This spice cake flour is very simple as the key ingredient in use is almond meal with a small amount of coconut flour. Almond meal is made from course grind sweet almond and is not the same as almond flour which is made from finely milled blanched almonds. I personally prefer almond meal as it is easy to obtain and more affordable than almond flour. Also as almond flour is still new to the world of bakery, there isn’t a whole lot of information on it, namely because many people are doing a fair bit of trial and error with it. I’ve used almond meal in a few recipes on my website including a rendition of Jamaican toto (coconut cake) flourless orange almond cake and this chocolate almond cake and so far the feedback has been positive and now it’s time to add this pumpkin spice cake to the mix. If you love all things pumpkin and with the spice to boot then this cake will seal the deal for you. The coconut flour addition is give the cake a tad bit more structure. You need a very small amount as listed as too coconut flour is highly absorbent so too much would soak up the wet ingredients (butter and eggs) like a sponge. The cream cheese frosting takes the cake to another level with taste and texture, so velvety smooth and irresistible in taste. You will be forgiven for dipping your finger in the dairy free cinnamon cream cheese frosting. Not only is it addictive but completely dairy free so what’s not to love? I’ve offered full guidelines in regards to making the frosting, although sadly it isn’t pipeable but good enough for dairy free, unrefined cake topping. Line a 9” non stick square baking tin with parchment paper,. In a small bowl, combine the almond meal, coconut flour, coconut sugar, baking soda, baking powder, salt and spices then set aside. Slowly add the dry ingredients into the wet bowl, increasing the speed of the blender so everything is fully combined into a smooth cake batter. Pour the batter into the square cake tin and give the pan a gently tap on the side so the batter is level. Bake for approximately 50 minutes, use a tooth to determine it’s readiness (it should come out clean). Once baked, transfer the pumpkin spice cake onto a cooling rack then place in the refrigerator to completely cool. Using a rubber spatula, gently fold in the powdered coconut sugar a cup at a time, be careful not to overmix. The cream cheese will be soft (not runny or pipeable) with a tanned hue. I find best consistency is formed with 2 cups but add up to 3 cups if you wish. Refrigerate frosting for roughly 30 minutes until it is more firm. Frost the chilled cake and serve immediately. Store the cake in the refrigerator until ready to eat. 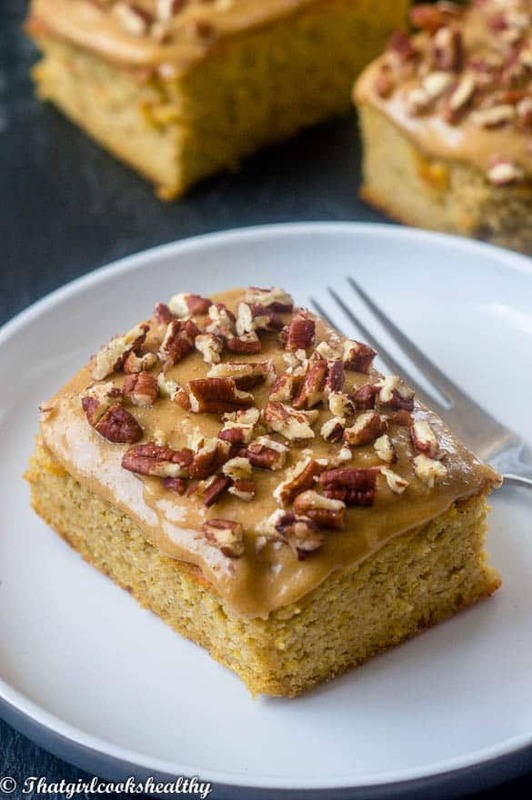 Spice cakes are always so fabulous, and with pumpkin spice added? Heck yes. Looks like a beautiful gluten-free cake!! Loving the gluten-free option for a pumpkin spice cake. Magnificent! I know, it’s great isn’t it. This looks so good! 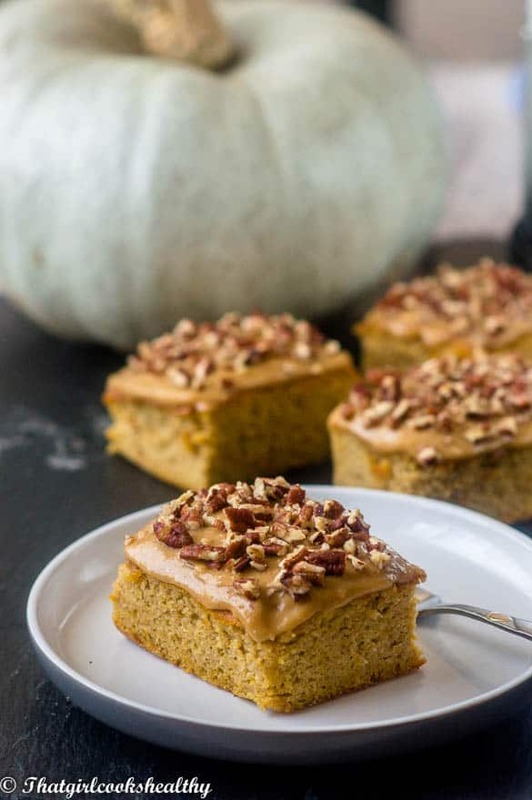 I love anything involving pumpkin, and I’ve never made a cake with almond meal before. I can’t wait to try it! 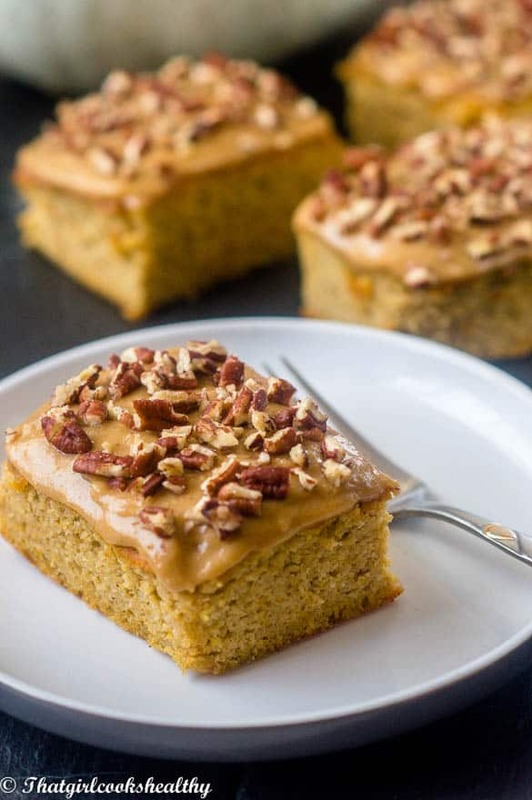 Always love a great pumpkin spice cake! Perfect flavors for this time of year!